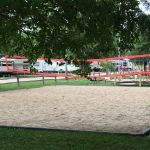 Ask fellow campers about "Grand Island KOA" and nearby attractions. A nice campground: easy to pull in. The bathrooms clean but they are unisex. I hate unisex as a women, because they are never as clean and well kept up as the women's restrooms are, when they are just women's restrooms. We camped at Grand Island KOA in a Motorhome. 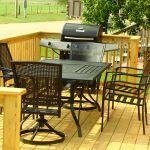 The rate was with a KOA discount. Very nice place to stay while attending the state fair in Grand Island (about 8 miles away). Easy on and off the Interstate yet very little noise from traffic. Very clean restrooms and showers. Wi-Fi and cable both worked well. Pizza/wings, etc. delivered to your site from the office/store. Would definitely stay here again. We camped at Grand Island KOA in a Motorhome. We stayed at this KOA while bringing our new RV from Minnesota to California. We had a nice pull through site with grass, shade and a picnic table. The pool was pristine. The restrooms and showers very clean. Everyone who worked here were very helpful and friendly. They have a well stocked little store and actually make pizzas. Good place to stop for the night. We camped at Grand Island KOA in a Motorhome. Easy access from I-80. Long pull-through site; did not have to unhook tow. Pleasant staff made every attempt to accommodate us in our 45 footer. As other reviewers stated, sites are extremely narrow, and park filled up. Felt like we could reach out and touch our neighbors. Very difficult hard right to exit from our site. Would not stay here again. We camped at Grand Island KOA in a Motorhome. We stayed one night in a 33 foot rig. It was a good KOA campground in a nice rural setting. Close to the interstate but noise was not a problem. Lots of kids having a great time. Everything worked fine and the showers, rest rooms, and laundry were extremely clean! It has a nice store (beer and local wine) and fresh pizza that they deliver to your site. The Wi-Fi was Tengo and it was fair. Our Verizon 3G data service worked well. Our only complaint was how close the sites were together. It got pretty full and we felt like the coach next to us was on top of us. We would stay again. 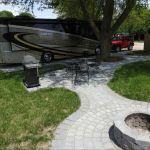 We camped at Grand Island KOA in a Fifth Wheel. We've stayed here a number of times over the last 2 years in the summer both for overnights and for several days at a time. The staff is helpful and very friendly. The pool is clean and a great place to cool off. The kids enjoy the playground and there is plenty of room to walk the dog. We definitely will stay here again. We camped at Grand Island KOA in a Fifth Wheel. This is a typical KOA park you find off the Interstate. A little traffic noise, level gravel roads and sites. Half of the sites have shade trees, we chose the other half that was open so we could get satellite. Our Sprint phone worked well, our hot spot was slow. The park's Wi-Fi kept cutting out, the owner said he was trying to get a different part for it. The pool and hot tub were not open, I guess it is a little early for that. Grassy area to walk the dogs. I just felt $36, with the KOA card, is a little steep for this park in this location. Good overnight stop though. We camped at Grand Island KOA in a Motorhome. 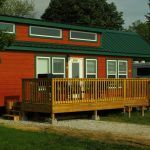 Level sites, facilities worked fine, Owners very friendly, fairly quiet even though it is close to the Interstate, WiFi worked fine. Rate is with the KOA card. We would stay there again. We camped at Grand Island KOA in a Fifth Wheel. What a nice KOA! We traveled to many over these beautiful United States, and this was outstanding. Easy on and off to Interstate, great pizza plus clean, friendly, pull-thrus, free WIFI, full hook-ups, cable TV, just a nice, nice place for our 35' motorhome. We will stop here again across the country. We camped at Grand Island KOA in a Motorhome. Spent the night here while traveling. Pull through sites were very close together, but they were level. For some reason there are very bright overhead lights. I could have read my newspaper outside after dark. Nice field to walk dogs. Also saw evidence that people do not always pick up after their dogs. 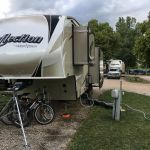 We camped at Grand Island KOA in a Travel Trailer. This is an OK campground. We were only here overnight and found it easy to get to and from the interstate. The pull-through sites are long enough so that we didn't need to unhook our car. There was just a small strip of grass between the sites. Good cable TV and Wi-Fi. The staff is friendly and helpful. They offer meals so we ordered a pizza delivered to our motorhome. Good place to stay when traveling east or west on 1-80. We camped at Grand Island KOA in a Motorhome. Friendly staff, good sites and excellent Wi-Fi service. We camped at Grand Island KOA in a Motorhome. Now this is a KOA! Very friendly staff! 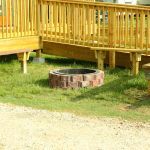 Mostly nice shady sites with long pull through sites. As the late arrivals arrive the staff has the great forward thinking of leaving a site open between you and them without stacking everyone on top of each other until they have too. Very clean facility! Surrounded by corn fields, very country feel. Easy access to highway with no highway noise. We would definitely stay here again. We camped at Grand Island KOA in a Fifth Wheel. We were originally planning to make this an overnight stop but extended two nights. Park is in the middle of a cornfield, but I didn't look to see if there was a baseball field built on the other side. Some sites are narrow, but I've seen worse. Our site was perfectly level. Although close to I-80, the corn seems to dampen the highway noise, at least this time of year. Nice pool and spa. Wi-Fi didn't work at all for a couple of days, but it started working on our third day. No services nearby, but virtually no traffic to get to them about 10 miles away. Some interesting historical sites in the area, but a bit of a drive to see them. Office makes hot pizza every day($$) and delivers to your site. We would stay here again. We camped at Grand Island KOA in a Fifth Wheel. This site was the last night of a 12 night trip. Relative to all the other sites we stayed at in WY, MT and SD, we thought we could spend 2-3 nights here easily as there was a lot of stuff for the kids to do. The site was very nice, with shade and grass. Hookups were easy, and the restrooms/showers were an easy walk. While we didn't use the pool/hot tub, it looked pretty inviting. We were going to swim, but the kids wanted to chase and catch fireflies instead. They gathered up a bunch and had a great time doing it. The showers were pretty clean with very nice water pressure. The water was a bit soft and smelled a bit coppery, but plenty of hot water. We camped at Grand Island KOA in a Motorhome. Grand Island has several restaurants. Friday summer evenings there is a free outdoor musical street event downtown. There are grocery hardware stores within 10 miles of this campground. I don't know about restaurants. It was rainy so we ate in. There are a LOT of flies and tiny bugs at this time of year, so come prepared! Order the pizza. It was great and delivered quickly. Walmart was 6 miles. Shopping and restaurants were 20 miles in Grand Island. Enjoy the reasonable cooked meals in the cafe. We had spaghetti with meat sauce and salad for 8.50 each. Cafe very clean. It was closed on Thursday and Friday. Sorry we missed the buffet breakfast on the weekends. Great option to unhooking toad to go hunting for dining. Grand Island is 13 miles northwest. Take NE-2 to US-30 west. City is large with national restaurant chains (Red Lobster, Ruby Tuesday, etc), fast food (DQ, McD's, Arbys, Taco Bell, etc). Ace hardware, Wal-mart (x2) but no fuel, Cenex diesel at $2.529. Autozone, O'Reilly's. VA medical facility. Churches. Banks. Parks & Recreation. Site number 15 was under a large shade tree and the end spot. Traffic noise from I 80 was minimal and we were at the north end of the campground. The Sturh Museum of the Prairie Pioneer is nearby and the best 8 bucks you will spend around here. Museum with artifacts and then outdoor exhibits include Indian Mound dwellings, log cabins, pioneer church, one room schoolhouse, and "railroad town". You need 2-3 hours minimum here. Great for kids to see. Pizza made fresh and delivered to your campsite! Only stayed overnight, Pilot about six miles west of park. 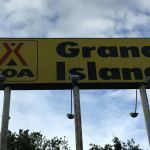 Are you affiliated with Grand Island KOA ?